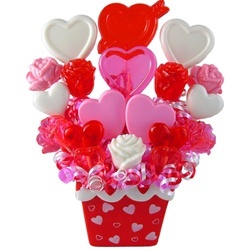 Edible Gifts Plus wants you to show some lollipop love by sending your sweetie a lollipop bouquet! National Lollipop Day is July 20th, 2009. To celebrate, we are donating 100% of the proceeds from all lollipop bouquets sold from July 20th to July 27th. The proceeds will go to Lollipop Theater Network, a nonprofit organization that brings the magic of movies to chronically ill children in hospitals nationwide. 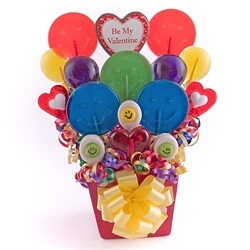 Send a sweet lollipop bouquet to someone special and you’ll be doing something sweet for chronically ill children across the country. 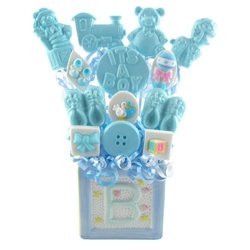 Whether it’s a birthday, anniversary, baby shower or any other special event, we have a lollipop bouquet for every occasion. And remember, WE ARE DONATING 100% OF THE PROCEEDS to Lollipop Theater Network from July 20th through July 27th. Being confined to a hospital can be a traumatic and stressful experience for any young child. Lollipop Theater Networks helps create a fun escape from the daily reality of the illnesses these children face and to offer them and their families a moment of normalcy in an otherwise stressful environment. But they can’t do it without our help! So don’t delay! Help bring happiness to children across the nation who must confront the reality of their illness every day! Thank you for helping to brighten the day of these wonderful children! July 14, 2009. 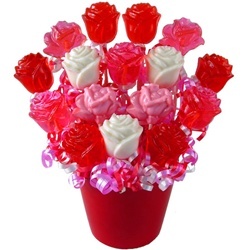 Tags: edible gifts plus, lollipop bouquets, lollipop gift baskets, lollipop theater network, national lollipop day. Uncategorized. Leave a comment.